Bed Bugs seem to be one of the most misdiagnosed infestations out there. Probably because they really haven't been in the news as much as we are seeing now. Since Bed Bugs can be seen by the naked eye, and for the most part, they do leave clues to their existence, they are fairly easy to find. Adult Bed Bugs are around 1/4 inch in length, while juvenile Bed Bugs are about 1/16th of an inch in length. They are flat and oval in shape. Colors vary depending on whether or not they have recently fed. But for the most part they are reddish brown. See pictures below. Bed Bugs like living under mattresses, I am guessing this is because they are closer to their food source, you. This should be one of your first places to check. They also leave small dark splotches when killed or where they go to the bathroom. When I am staying somewhere I am not sure of, Hotels, Motels maybe a friends house, the first thing I do is look under the mattress for dark splotches or the bugs themselves. 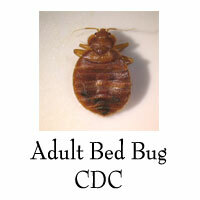 Also check pillows, don't be afraid to pull the pillow cases off to check for signs of bed bug infestation. They also like to hide in dark corners, dresser drawers, baseboards etc. Bed Bugs are nocturnal so they mostly come out at night when you are sleeping. If you wake with any bites or welts that's also a pretty good sign that bed bugs are near. Don't confuse mosquito bites, chiggers, no-seeums with bed bug bites. One of the pictures listed at the bottom of this article shows what bed bug bites could look like. Remember, if you are not sure ask a professional. For the most part, everyone is different, bed bug bites cause more emotional then physical damage. 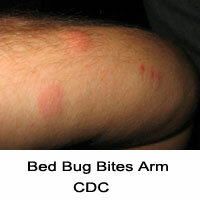 Although bed bug bites are very visible and itchy. The CDC(Center For Disease Control), does say that bed bug bites can be treated with topical emollients or corticosteroids. Oral antihistamines are also suggested.